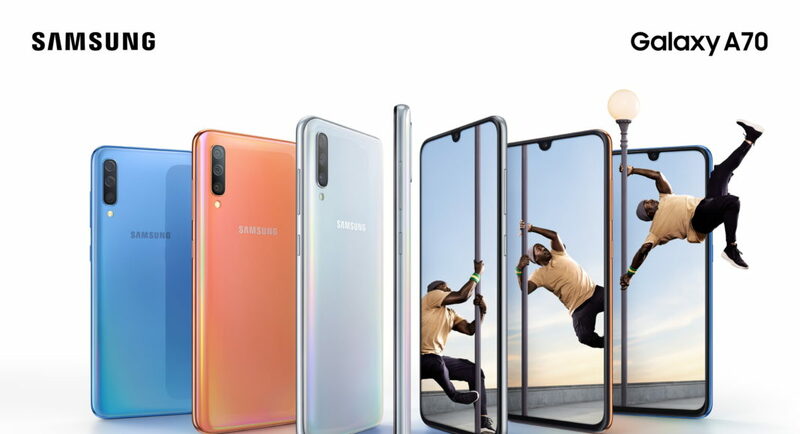 Samsung is keeping its promise to launch more handsets in its Galaxy A-series smartphones and has released the Galaxy A70 today at an event in Bangkok. Samsung Galaxy A70 was launched alongside the Galaxy A80 at the event called ‘A Galaxy Event’ in Bangkok. Till now, Samsung hasn’t revealed the price or the availability of the Samsung Galaxy A70, but since the device has been introduced and launched it will be made available in the markets soon. The Samsung Galaxy A70 comes in four colour options – Black, Blue, Coral and White and features a Glasstic build. It also has a prism effect which reveals the gradient finish at its back depending on which direction the light hits it from. The Samsung Galaxy A70 sports a 6.7-inch Full HD+ (1080 x 2400 pixels) Super AMOLED Infinity-U display with an aspect ratio of 20:9. The device is powered by an octa-core CPU with dual 2.0GHz core along with six cores clocked at 1.7GHz. Although Samsung hasn’t mentioned which processor is powering up the Galaxy A70 but depending on the company’s history of using CPUs and the region, it could either be from Qualcomm Snapdragon or Exynos. Samsung Galaxy A7 comes with 6GB and 8GB RAM variants with a single 128GB storage option. The device also supports microSD card of up to 512GB and has a dedicated slot for it. The Samsung Galaxy A70 comes with dual-SIM card support and it packs a huge 4,500mAh battery with Super-Fast charging support. The newly launched smartphone runs Android 9 Pie skinned with One UI and it comes with in-display fingerprint scanner along with a face unlock feature. Its dimensions are 164.3 x 76.7 x 7.9 mm. On the camera front, the Samsung Galaxy A70 holds a triple rear camera setup which comprises of a 32MP main camera with an f/1.7 aperture paired with an 8MP ultra-wide sensor with an f/2.2 aperture and 123 degrees along with a 5MP depth sensor with an f/2.2 aperture. While on the front there is a 32MP selfie camera as well with an f/2.0 aperture. The rear camera of the Samsung Galaxy A70 can recognize up to 20 scenes and it also comes with Flaw Detection which automatically identifies glitches.